Now, the Punjab Congress Chief, Captain Amarinder Singh has announced free 50 lakh 4G enabled smartphones to the youths of Punjab. The youths aged between 18-35 and have passed their 10th with an annual household income less than 6 lakh will be eligible to get the phone under the Captain Smart Connect scheme. While this might be a part of Prime Ministers Narendra Modi’s ‘Digital India push’ to empower the Indian youth and connect them digitally, however, the youth of the state need to cast their vote to Congress and power Amarinder Singh. 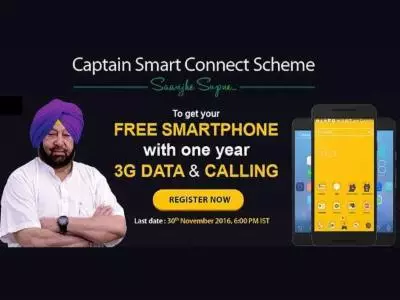 The Captain Smart Connect scheme will be implemented after Congress comes to power and to avail this scheme, youths have to register online on the captainsmartconnect.com website. The website will be open from 20th to 30th of November. The users also need to take a printout of the receipt and keep it safe as they will have to produce it while claiming the smartphone. Captain Amarinder Singh on his twitter handle also mentioned that his government will allocate 4-5 thousand crores from the budget for this new scheme and also said that the roll out would begin within 100days of his government. Further while addressing the media, Amarinder stated that the scheme would cost about Rs 300-Rs 400 crores annually after the initial investment in the first year, and the allocation will be made in the state budget itself to fund the scheme as part of the government’s youth welfare programme. Regarding this, the government has said that they will give an official notification in the newspaper. Youths will also receive a message on their registered mobile number and email ID with directions on how and where to claim the smartphone. The device will be distributed after 100 days of Captain’s government, and same will be mentioned in the newspaper.Regarding this, the government has said that they will give an official notification in the newspaper. Youths will also receive a message on their registered mobile number and email ID with directions on how and where to claim the smartphone. The device will be distributed after 100 days of Captain’s government, and same will be mentioned in the newspaper. Only one phone can be claimed by one person. However, 5 OTP’s can be generated from a single smartphone which will allow five people to apply for the smartphone.